The correlation between recurrent bleeding on probing and the progression of periodontal destruction is suggested in many studies. One of the main goals of the periodontal treatment is the achievement of good control of the gingival inflammation and the reduction of the active periodontal sites. 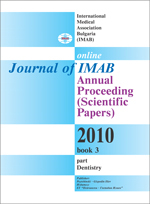 Aim: Evaluation of the effectiveness of treatment of severe chronic periodontitis with additional target antibiotic administration in comparison with the therapy with adjunctive antimicrobial combination amoxicillin + metronidazole and conventional mechanical periodontal treatment regarding the achieved control of the gingival inflammation and BoP. Results: Significant reduction of the gingival bleeding and the BoP is achieved in all groups. In the group with target antibiotic administration the final mean values of the GB (gingival bleeding) and BoP (bleeding on probing) are the lowest and could suggest a low risk for progression of the periodontal disease. Key words: gingival inflammation, periodontitis, periodontal disease progression, risk assessment. 2. Dahlen G. Role of suspected periodontopathogens in microbiological monitoring in periodontitis. Adv Dent Res 1993; 7(2): 163-174. 3. Djemileva, T. Periodontal diseases. Azer Sofia, 1999, 367p. 4. Djemileva-Konova, T. Clinical and experimental data for the influence of the dental plaque upon gingival tissue. Diss., Sofia, Faculty of Stomatology, 1976, 250p. 5. Haffajee AD., Cugini MA., Dibart S., Smith C., Kent RL., Socransky SS. The effect of SRP on the clinical and micro­biological parameters of periodontal disease. J Clin Periodontol 1997; 24: 324- 334. 7. Nishihara T., Koseki T. Microbial etiology of periodontitis. Periodontology 2000, 2004; 36: 14–26. 10. Socransky SS., Haffajee AD. Periodontal microbial ecology. Periodontology 2000, 2005; 38: 135–187. 11. Socransky SS., Haffajee AD., Cugini MA., Smith C., Kent RL. Microbial complexes in subgingival plaque. J Clin Periodontol 1998; 25(2):134-144.